The Holy Provincial Synod of the Church of Crete, met today, 16 March 2017, in Heraklion at a Session and dealt with the life of the Local Church and Church Education. 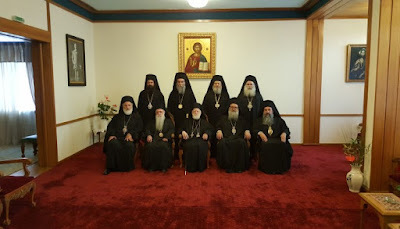 The Holy Synod, among other things, examined the issue which has lately emerged, concerning the cessation of commemoration of their Canonical Bishops by some Clergy of the Church of Crete during the Divine Liturgy, the Holy Mysteries and the Holy Services. The Reverend Hierarchs of our Church of Crete, with pastoral love and affectionate care, invites clergymen to stop this improper behavior. Indeed, it has appointed by unanimous Synodal Decision, a three-member Committee consisting of His Eminence Metropolitan Gerasimos of Petra and Cherronesos, Abbot Archimandrite Philotheos Spanoudakis, and Protopresbyter Zacharias Adamakis, President of the Union of Associations of Clergy of the Church of Crete, in order to meet and reason with them in the coming days. The Holy Synod expects with good hope in the good results of this meeting, under the stipulations of the provided Divine and Sacred Canons of the Church and the current Laws. Lastly, the Holy Synod wishes for the faithful and blessed people of the Great Island of Crete to accomplish with health and strength the remaining solemn period of Holy and Great Lent, and to celebrate hopefully "the Venerable Passion" and the Holy Resurrection of our Lord, in conformity with the dictates of the Church.